Alice and Stuart get along pretty well. Their relationship is usually good and certainly fascinating to observe, especially when they have friction. Last night, Stuart was pushing Alice's buttons and when she had enough she turned to him and said, "Stuart! You a jerk!" and proceeded to list out all the things that she felt insulted about. Stuart fired back that he was not a jerk and before the bickering could get out of hand, I separated them (Alice needed to go brush her teeth and change for bed) and I turned to Stuart and said, "Hey Stuart - you're not a jerk, but sometimes you act like one." And his response was, "yeah, dad, I know." Alice and I do a lot of things together to help her build independence. Shopping with her is usually a very pleasant experience. At this point she knows the process well enough that we have established a rhythm to getting the groceries. She gets the items on her list and crosses them off on her clipboard. It's worked well and transfers to other aspects of her life. There are some nice fringe benefits, too: Alice is out and active in the community and there are a number of clerks in the store who know Alice by name and understand that she is working when she is in the store. On her list, I always put at least one thing that requires her to stop at a counter and ask for something specific. For example, today she had to ask for "1 pound of light American cheese" at the deli counter. The worker at the counter recognized her, greeter her (not me) and asked her for what she wanted and he also made an effort to listen closely so he could here. The grocery store, Big Y, has been very accommodating and is very accessible to Alice for most things. Some times she needs assistance for things that are too high up, but it's not too bad. I try to keep an eye out for things in her world that are needlessly inaccessible. Alice can reach the ice dispenser in the machine and operates it naturally. 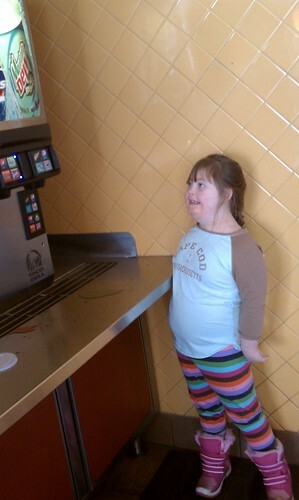 She can't, however, operate the soda dispenser. This is because Taco Bell, in it's infinite wisdom, chose to put in a machine that requires two hands to dispense soda. In theory, you can place the cup on the grill and then push the button, but there is no way to align the cup and the distance from the nozzle ensures that soda sprays everywhere or knocks the cup over or both. The traditional dispenser with a lever that activates the nozzle is ideal as you only need one hand for it. This is such a horrible design and it won't get any better. It's a pity and I'm not sure how to approach it. It's not exactly the kind of thing you can say to the manager and hope to get traction, "hey - like your restaurant, it's nice and clean and my daughter and I like to eat here, but could you replace your soda dispenser with one that she can operate on her own?" Not likely, and asking for help is an option, but it goes against the whole notion of independence, and Alice truly likes doing things on her own (except when she's feeling lazy, but that's a story for another day). Still, we sit down and she has crunchy tacos and I have soft tacos (she can't have wheat and I can't have corn - we're quite a pair). I like putting on their Fire Sauce and Alice has adopted that too, although today she declared that the sauce was "wicked hot". We've been trying for some time to build independence in Alice, especially in self-care. It's been a long path and we've had a number of successes. Alice dresses herself daily and manages most of her care in a timely manner. Bathing has been tricky. Alice has trouble getting shampoo for herself and enjoys bath time enough that she would likely stay in the tub for more than an hour. Clearly not acceptable. I've been running her against a timer with moderate success, but her compliance has drifted. This past week, we made this sign and when she was able to get her hair washed and rinsed in 5 minutes, I marked it with a smiley face and set her to work washing her body. We listed out everything she would need to wash and set the timer. When the timer went off, I checked on her and she had washed her stomach and feet, but not the other things she needed to, so I drew a frowny face. OH. MY. GOD. It was as if I had eviscerated a teddy bear in front of her. It was astounding. I was now the worst person in the universe because she spent the next half hour telling me so. But you know what? The next bath time she got through as quick as possible just for that smiley face. This is so easy. Laminate the paper with the steps on it. Tape it to the bath wall. If you don't have a laminating machine, you can take the paper to most printing or larger office supply places and have it done there. Talk about what needs to be done for a step. Set a reasonable timer for the task (we're using 5 minutes). If the task is completed on time, draw a smiley face. If the task isn't done or is partially done, draw a frowny face or leave it blank. 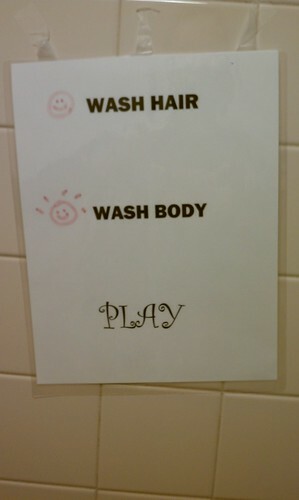 If the tasks are done on time, allow some play time as a reward.